June 02, 2015, 4:06 p.m. The importance of a healthy diet and avoiding tobacco use and excessive drinking are now well known, but adequate sleep is also a critically important part of a healthy lifestyle. Traditionally eight hours a night has been the guideline, but sleep experts have said that healthy adults can do with as little as seven hours a night. 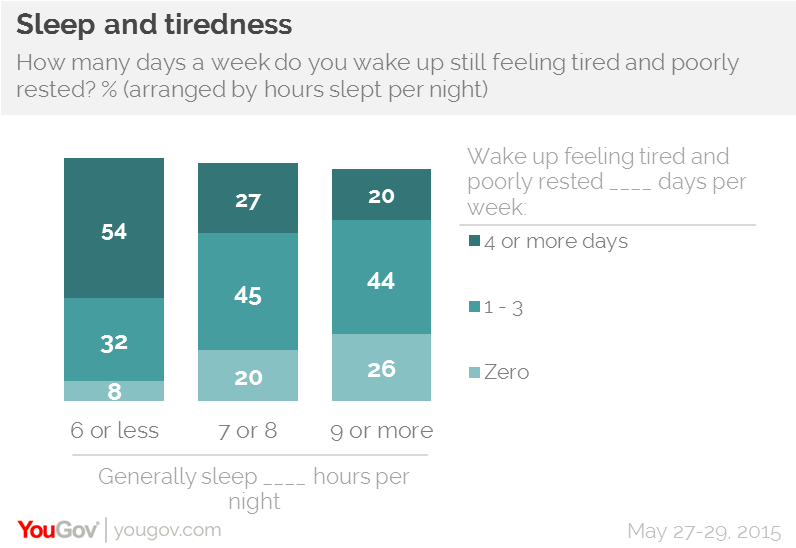 People who do not sleep enough face a range of health risks, including high blood pressure, strokes and even Alzheimer&apos;s.
YouGov&apos;s latest research shows that a significant number of Americans don&apos;t feel fully rested for most of the week. Only 15% of Americans report not waking up even one day a week feeling tired and poorly rested, while 40% say that they wake up once, twice or three times a week feeling poorly rested. 38% say that they&apos;re poorly rested four or more days a week. This widespread tiredness has an obvious explanation: people just aren&apos;t getting enough sleep. While 54% say that they sleep the recommended 7 or 8 hours (and a lucky 6% report sleeping 9 hours or more each night), 38% say that they sleep for 6 hours or less most nights. Among people who say that they sleep 6 hours or less, 25% report waking up tired each day and 54% report waking up tired most days each week. Among people who slept the recommended amount only 27% report waking up tired most of the week. Our dreams can have a big impact on the quality of our sleep and, indeed, how much sleep we actually have. Among Americans who have nightmares only a couple of times a month or less, 56% report sleeping 7 or 8 hours a night while only 38% sleep 6 hours or less. People who have nightmares on a weekly basis, or more frequently, tend to sleep much less. 46% of these people sleep 6 hours or less each night while only 44% sleep the recommended 7 or 8 hours. Younger Americans are much more likely than their elders to report having frequent nightmares. 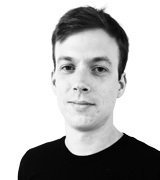 While only 20% of over-65s report having nightmares at least once a month, 34% of people under the age of 30 report having troubling dreams at least monthly. People aged 30 to 44 (14%) are the most likely to report having nightmares at least a few times a week.